Once again, let me emphasize that you can get a great selection of books from antique stores. I love to get all sorts of books about Arizona's history at antique stores because they're generally at low prices (sometimes very low prices) and often they're books that you can't really buy new anymore or if they are available new they're only for sale at specific museum stores or online. I've picked up a couple of Sharlot Hall books in this way, and I randomly started to read this one first because it looked short and I wanted a break from the "newer" books I've been reading lately. At about ninety pages, I thought that this would be a book I could finish in a couple of days. But I'll be honest and say that the first quarter or third of it was dry and not overly interesting to me. As you can see from the front cover, this book is Sharlot Hall's travel diary of her trip through Northern Arizona in 1911. Now, I've read travel diaries and memoirs and such before without any problem, but I think it was mainly the content that would slow down my interest in this particular diary. You see, Sharlot made this trip in order to observe and record this particular section of Arizona and to explain to Arizonans what the land, together with its resources, was like. So she'll talk about the geography and the plants and the types of animals that do well there and what crops she thinks might grow there--and given that this is all talk from a completely different time in history and has therefore lost some of its relevance, it just didn't keep my interest. However. Once the journey really starts taking off, right about at the point where they pass Flagstaff, there is so much beautiful land that they cover that this writing does take on a more poetic quality, which is what is more interesting to me to read. Now, I had never that I can recall heard the term "the Arizona strip" before. It's that piece of land above the Grand Canyon that used to be fairly inaccessible to the rest of the state, so much so that it was more connected to Utah than to Arizona (when Utah became a state, they did want to annex this land). At Sharlot's time, you could only access it by Lee's Ferry (which is around present day Page, to give you an idea of location). So at the time when Arizona was getting a bridge into this isolated bit of land, Sharlot was advocating for making use of this land (and not letting all the profit go up to Utah instead of to the rest of Arizona) and also for showing people the beauty of it and encouraging tourism there. So from a historical standpoint, this is all very interesting. Once they passed through Flagstaff, they started to get Painted Desert views. Now, I love the Painted Desert; it's one of my favorite places. It's such poetic land that speaks a thousand stories in a thousand colors. I adore it. Sharlot, too, was quite taken by the views. So I really enjoyed hearing her perspective on it all. For that content alone, this book was worth reading. And I say the Painted Desert, but it's also the red rocks and such as you get closer to Utah that she describes. A little bit on the Grand Canyon, too, but not as much, maybe because she knew that other people had already given descriptions of it. If you weren't aware, Sharlot Hall did write poetry, as well. Hence the beauty of her descriptions and her ability to quickly provide an assessment of a scene or situation. Honestly, I really only knew her name from the Sharlot Hall Museum in Prescott; I knew that she was a writer, I guess of poetry and non-fiction--but that's about it. 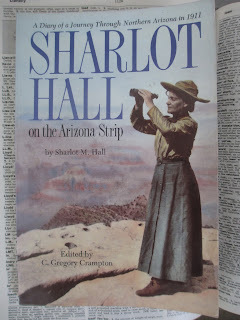 This book has an introduction that explains a little about who Sharlot was, what she did, and why she was such a significant figure in Arizona's history. Absolutely fascinating material; I definitely enjoyed the introduction more than the first quarter of the book itself. Sharlot Hall was a fascinating person. She was the first woman in Arizona to serve in public office, as the Territorial Historian of Arizona in 1909. Hence her explorations of various undiscovered corners of the state and her writings on what she found there. She's also the one who restored the governor's mansion at the Sharlot Hall Museum and put together much of what is now at the museum (it's a great museum to visit, by the way). So while this particular book may be one of her more random writings that will perhaps appeal to less readers, it is a worthwhile read if you're interested in Arizona history or in Sharlot Hall. I'll leave you with one last thing to think on. Did you know that Congress wanted to admit the Arizona and New Mexico territories as a single state? Can you imagine? They have such different personalities today and the two are both so big that it's hard to imagine them being one huge state. Sharlot Hall wrote her poem "Arizona" in protest of this statehood bill. Of course, eventually Arizona and New Mexico were allowed to enter the union as separate states, which is how we know them now. I just never knew that the idea of combining them like that was once on the table.